Must be boiled in Microwave to reach liquid state. PLEASE DO NOT FORGET TO PUT ON THE LID PRIOR TO USING INSIDE MICROWAVE. The Replacement ant gel comes a semi solid chunks. What is required is removing all of your old gel and the ants to avoid any contamination. Make sure you clean your container quite well. 1. Chop up Gel In small parts (Smaller the better REALLY THEY MUST BE TINY) Place gel inside a container that has a lid. This will prevent evaporation. Make sure this container you can see through and will not melt. 3. Turn on microwave must be 1800 watts or stronger. Time will vary per microwave. 4. Let the Gel boil for 60 seconds and sit. 5. Look through your microwave glass and see if all replacement ant gel is in a liquid state. If not let boil in microwave for another 60 seconds. The container will need to be tapped on top bottom and sides occasionally while cooling to remove the bubbles. Some bubbles may still remain but the unit will be functional and like new again! BE CAREFUL THIS IS HOT AND MAY CASE SCALDING, BURNS, OR OTHER DAMAGE. 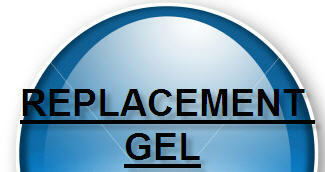 REPLACEMENT GEL IS FOR USE BY AN ADULT ONLY.